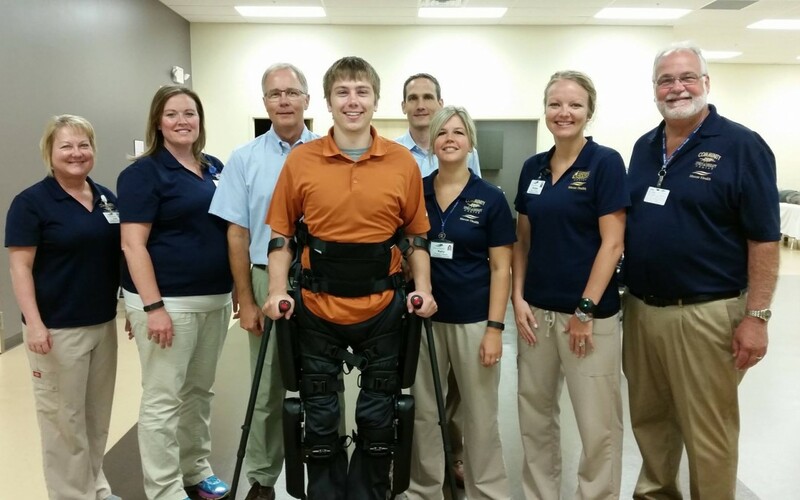 Mercer Health’s Rehabilitation Services team, in affiliation with the Community Sports and Therapy Center, is pleased to announce expanded services allowing wheelchair-bound individuals to stand and once again walk. ReWalk Robotics Inc. has designed and developed the ReWalk Personal System 6.0 that is designed for all day walking available for use at home and in the community. Rewalk Robotics Inc. recently has certified Mercer Health’s Rehabilitation Services team, in affiliation with Community Sports and Therapy Center, as one of only three ReWalk Rehabilitation Training Centers in the state of Ohio and one of less than 200 certified centers worldwide. The mission of ReWalk is to fundamentally change the quality of life for individuals with lower limb disability through the creation and development of market-leading robotic technologies. Designed for all day use, the battery-powered system features a light, wearable exoskeleton with motors at the hip and knee joints. The ReWalk Personal System controls movement using subtle changes in user’s center of gravity. A forward tilt of the upper body is sensed by the system which initiates the first step, and repeated body shifting generates a sequence of steps which mimics a functional natural gait of the legs. Current ReWalk designs are intended for people with paraplegia, a spinal cord injury resulting in complete or incomplete paralysis of the legs. The system uses patented motion sensing technology along with battery-powered motorized exoskeletal components that power knee and hip movement which is controlled by proprietary on-board computers and software. The system’s extensive software is programmable and allows for fine tuning of the various detailed parameters that are involved in normal movement, transfers and walking. The ReWalk™ systems allows the user to sit, stand, walk, turn and has the capability to eventually allow users to ascend and descend stairs. ReWalk users are able to operate the systems and directly control their movement and position in space. “Todd Reigelsperger is our first patient to use this new technology in our clinic. Todd is a local young man who is extremely motivated and excited to be a part of this new service. At Mercer Health and the Community Sports and Therapy Center, our mission is to meet a wide variety of health needs locally in our community. We are so glad we are able to provide this service for Todd and for others with similar needs!” Hibner stated. Healthy Waves Challenge & On Your Mark, Get Set, MOVE!